As the Troy students return to campus for a new fall semester, the Trojan football team is preparing for a new season full of its own challenges. 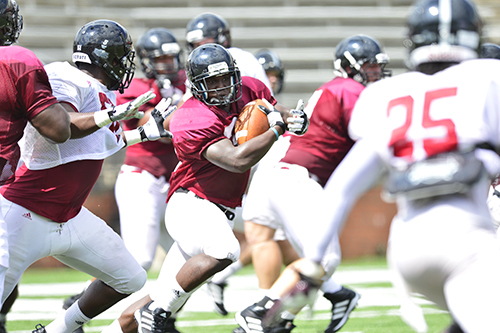 With a disappointing 5-7 2012 season in the rearview mirror, the Troy coaches are excited about this year’s team, young and old, as they near the 2013 opener at home against UAB on Aug. 31. 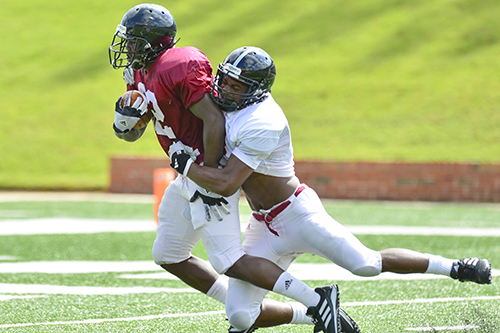 The Trojans had a fall scrimmage on Saturday, Aug. 10, and the Troy offense hit the ground running, literally. 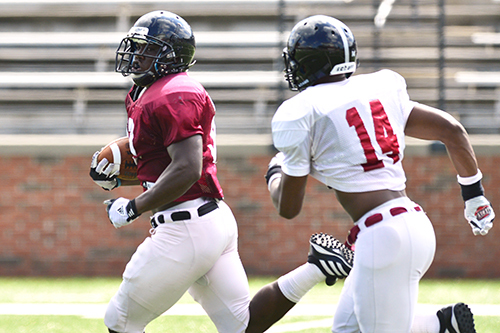 Sophomore running back Brandon Burks gashed the Trojan defense with three carries for 65 yards and a touchdown. 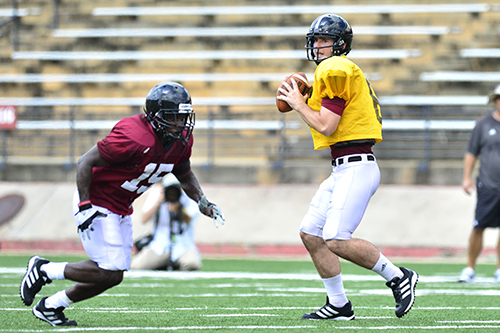 Troy offensive coordinator Kenny Edenfield was excited about this year’s squad talking about the luxury it is to have senior quarterbacks Corey Robinson and Deon Anthony on the same sideline. “We have got two guys that we trust right now to play at any time, and we are going to play them both,” Edenfield said during Troy’s Saturday football media day. The offensive coordinator even joked that he wished they could play Robinson and Anthony both 80 plays during games but since he couldn’t they would play Robinson at receiver a bunch. Edenfield had high praise for his group of wide receivers saying that the first four receivers, led by Eric Thomas and Chandler Worthy, will not fall off compared to last season’s talent of Thomas, Chip Reeves and Chandler Worthy. The two youngest areas on the offensive side of the ball are offensive line and running backs but Edenfield was pleased with the potential of his linemen. With junior left tackle Terrence Jones leading the O-line, Edenfield said that there are five or six guys that have stepped up for playing time along with some younger guys that are going to help out. “We are just going to keep moving those guys around to get the best five on the field,” Edenfield said. The offensive coordinator also likes that the competition between the younger and older running backs is making them all better. Who will be the number one back in the UAB game? Well that remains to be seen but Burks caught some eyes with his performance in the Saturday scrimmage, so don’t be shocked if #32 is starting before it is all said and done this season. “We want to run the ball in the fourth quarter because that means you’re up,” Edenfield said. One area of the Troy offense that can’t be forgotten are the tight ends Jim Teknipp and Tommy Blevins, who serve as blocking and receiving weapons for the Trojans. Edenfield is looking for depth in his squad because running a fast-paced offense will wear down a defense but the trick is not to wear down the offense.